WinPatrol is a multifunction utility which has been designed to help monitor and protect your system, helping to maintain the security and performance of your computer. It allows you to find out and better understand what programs are attempting to change your settings or what programs are trying to add themselves to the system. WinPatrol monitors and helps you maintain control over several important areas of the operation system that are often targeted by malware and spyware. One of the areas WinPatrol can monitor and control is a number of start-up locations including the registry Run and Runonce entries, the start-up folder and also hidden start locations. There is also the option to move start-up items to the Delayed Start tab to delay programs not needed immediately, helping boot speed. You can also terminate active tasks and scheduled tasks. The cookie control feature allows you to automatically delete cookies from Chrome or Internet Explorer when a predefined word or phrase is contained within them. Additional features include a WHOIS lookup tool, view the HOSTS file, registry monitoring and the viewing of ActiveX controls, hidden files, file types, services and IE Helper objects. WinPatrol aims to be easy to use, but still offer enough powerful features to make it an essential tool to have. There is a free version and a paid version available which obviously unlocks some of the features. WinPatrol also has a stand-alone portable version called WinPatrolToGo which can be run from a USB flash drive or other portable device. A useful option if you don’t plan on keeping WinPatrol installed and only want to use it for a couple of quick checks or changes. Even if you don’t use WinPatrol that often yourself, it definitely comes in handy for troubleshooting on other systems and is a utility you’ll still want in your toolkit. The PLUS version of WinPatrol costs $29.95 and gives your computer real-time infiltration detection and also access to the WinPatrol PLUS knowledgebase which is available online 24/7. Right click on just about any entry in the program and select “Plus Info…” to open a webpage. The knowledgebase is very useful because it gives very detailed information about the process or service for mere humans to read, not just computer geeks. Some of the process information even contains links and program tips that might be useful. If you cannot afford the PLUS version of WinPatrol, here is a trick on how to view the PLUS info for a process. 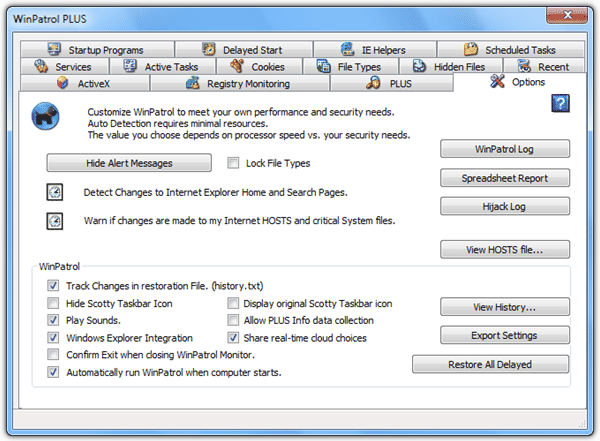 The below example is to view the PLUS info for iexplorer.exe (Internet Explorer). If you want to check for another process, simply replace iexplore and iexplore.exe (in bold) with the process that you want to check. As for WinPatrol’s Real-time Infiltration Detection (R.I.D.) technology, the only way to get it working is to activate the PLUS version. Honestly speaking, I would rather use the free version of WinPatrol and spend $29.95 on a decent quality Antivirus package than spend $29.95 on WinPatrol PLUS alone. The big difference is antivirus programs are subscription based and you’ll need to renew every year but as for WinPatrol, you only need to pay once because it’s a single user license that can be used on multiple systems. The good thing is now and again, Billp Studios have a promotional offer and the last time around I got a lifetime license for $0.99! If you can catch the promo at the right time, definitely worth it for a dollar. On the plus side, WinPatrol is a small and lightweight tool that is easy to understand and has more useful features than something like HijackThis. And the knowledge base is useful at helping to find the processes you’re not sure about. On the not so great side, even though it’s a lifetime license, the PLUS version does seem a bit over priced considering the only things you really get are access to the PLUS knowledge base, real-time infiltration detection and can monitor parts of the registry. This might be a small added layer of protection on top of other security software, but make sure you have secured yourself with the appropriate Antivirus, Firewall and Antitmalware type software before you consider buying WinPatrol PLUS. WinPatrol has long been a favorite utility of mine. There are different levels of malware detection. WinPatrol is a great utility for spotting activity that most viri scanners and spyware removal tools will miss. The Plus price IMHO is well worth the value. As Bill mentions, it’s not a yearly price, nor a per PC price. However, whilst I’d normally have gone “yipee, another WP review” (I love WP hehe), I must confess to being rather annoyed with Raymonds review. Why is a so-called professional using and admitting to using, cracks? Thats not gonna go down well in the sec com. As owner and author of WinPatrol I\\\’ll just say thank you for taking the time to write about WinPatrol. I thought your assessment was fair. MD5 is on our list of future enhancements and I\\\’m sure with some more knowledge of using WinPatrol you could have removed Bifrost. I also am thinking of a price reduction but since WinPatrol PLUS isn\\\’t a yearly subscription and isn\\\’t limited to a single computer I think it\\\’s still a good value. As Temerc pointed out, if you had Emailed me I would have provided you a PLUS code for your review. The only real error was the mention of our Who\\\’s function. That hasn\\\’t been around for a long time. @ TeMerc are you the owner of this program. I can market it for you if you like. Raymond used a pirated key to test your application. I doubt he kept it, or shared it with anyone. (He didn’t put it in the post). Then he gave the app a favorable review; enough so that I may try the application out for myself. I’ve heard of the program but never heard enough to actually check it out. After reading this maybe I will…. Instead of getting on your high horse and denouncing one of the most consistent and fair reviewers on the internet, maybe you should call Bill and tell him that thanks to Raymond, over 36,000 tech savvy users just read a free advertisement for WinPatrol. That should be worth at least one golden “legitimate” key for the app. Raymond keep up the good work!!! Tool That Sniff Out Malicious Mysteryware. In so far as WinPatrol being unable to remove a Bifrost trojan, it’s not designed to by any stretch. It’s not any sort of scanner in the conventional anti-spyware scanner realm. It’s a fair HIPS tool, but one that many of the advanced malware infections easily bypass. But ehen again, they also bypass many of the more conventional ‘live’ monitoring anti-spyware tools too. And I’m not sure what the point is in saying you grabbed a pirated key for it. If you’d have asked, I’m fairly certain Bill would have given you one. That would have been a far more professional thing to do especailly if you’re an experienced reviewer such as yourself. What you did is fairly disappointing.